Energy efficiency is today a crucial topic in the built environment - for both designers and managers of buildings. This increased interest is driven by a combination of new regulations and directives within the EU and worldwide to combat global warming. All buildings now must now acquire and display an EPC (energy performance certificate), a rating similar to the A–G rating given to white goods. But in order to understand how to be more efficient in energy use, you need first to understand the mechanisms of both energy requirements and how energy is used in buildings. 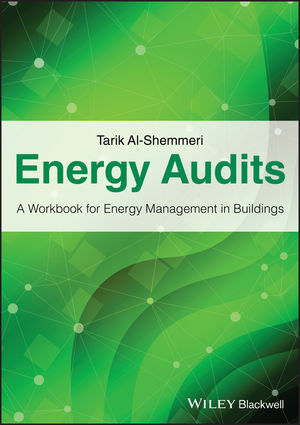 Energy Audits: a workbook for energy management in buildings tackles the fundamental principles of thermodynamics through day-to-day engineering concepts and helps students understand why energy losses occur and how they can be reduced. It provides the tools to measure process efficiency and sustainability in power and heating applications, helping engineers to recognize why energy losses occur and how they can be reduced utilizing familiar thermodynamic principles. The book explains the theory; illustrates it with case studies and worked examples; and then tests students’ understanding with tutorial problems. This is an invaluable resource for students on engineering and building courses where energy management is now a core topic. Tarik Al-Shemmeri is Professor of Renewable Energy Technology, Faculty of Computing, Engineering & Technology, Staffordshire University. He teaches energy management at both MSc and BEng/MEng levels and researches renewable energy technology. Energy Audits Visit the companion website to access the supporting materials for both students and lecturers: solutions to tutorial problems, showing full workings; discussion topics; PowerPoint presentations for each chapter; spreadsheets for students calculations; samples of energy audits; exam questions and answers.